This site outlines some of our teaching and research activities. We work in the field of condensed matter theory, which is devoted to the study of systems with many particles where quantum effects are important. 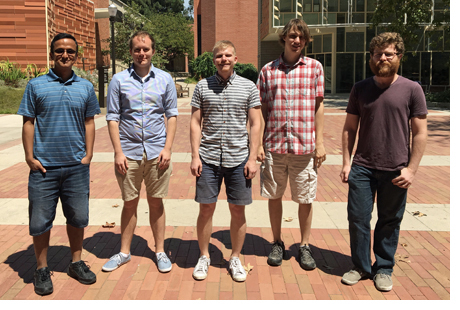 A particular theme of our research here at UCLA is the study of topological phases and other topological aspects of condensed matter. Condensed matter systems, due to their inherent complexity, often have measurable properties which are not quantized. In some rare cases, there is a quantization of observable properties. When this happens, there is almost always a topological explanation. These rare cases are the focus of our research. Find out more about theoretical and experimental physics by exploring the UCLA Department of Physics & Astronomy website. Read more. Using powerful experimental probes and mathematical techniques, researchers in the Condensed Matter Physics group explore the properties of quantum matter. Read more. We gratefully acknowledge funding from the National Science Foundation and the Alfred P Sloan Foundation. Graduate studies at UCLA offers unparalleled opportunities and support for professional and career development. Find out more about graduate studies in physics & astronomy. Read more.